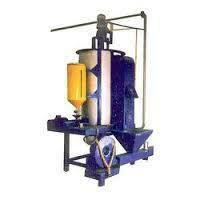 Divine Engineering was started in 2000.We are offering a wide range of Molding Machines. It find application in various industrial units for their better operational life and high tensile strength. It is made by high quality material by our vendors with international parameters. Our clients can avail these in various specifications at competitive prices. We bring forth a distinguished range of Trimming Machine. In our range, we have two unique model G TRIM 20 / G TRIM 40 in 2 capacities that accommodate most of the pressure die cast component. We bring out a fettering station on specific inquiry with our clients. Furthermore, our technical team visits the production spot, and custom design the fettering station for ensuring high productivity and less worker fatigue. The entire assortment is offered in different specifications as per the specifications detailed by the clients. We have set benchmarks in the industrial sector and have successfully raised the bars of customer satisfaction by offering Trimming Machines that are easy to use and have a long functional life. Trimming Machines are absolutely safe to use and are technically advanced.